From the first moment his ships were missed, the lost expedition of Sir John Franklin has fired the imagination of poets, dramatists, and (especially) novelists. At last count there were no fewer than twenty-four novels, ranging from Jules Verne’s The Adventures of Captain Hatteras in 1864 to Dominique Fortier's On the Proper Use of Stars, which just appeared in English translation last month. Essays by writers as diverse as George Eliot, Joseph Conrad, and Margaret Atwood, have tackled the Franklin fascination, and a full collection of all the historical studies, monographs, and illustrated books on the expedition would easily fill a room (my own collection, which is very far from complete, already fills one). There have also been at least five full-length documentary films, although not yet a feature film of a purely dramatic sort (although I know of at least three screenplays for proposed films). For this entry, I’ll focus on the fictions – and the differing ways they draw upon the basic outlines of the Franklin story. Franklin himself has fared rather unevenly in this body of work; he has been portrayed, variously, a sort of saint of “slowness” (Nadolny), a neckless nabob fleeing from a domineering wife (Flanagan), a dim-witted leader known to the Indians as “Thick English,” a snowbound abbot of a shipload of polar monks (MacEwen), and the first victim of a bloodthirsty Wendigo (Simmons). To some, he was a hero – but to some (to paraphrase Johnny Cash) his score was ‘zero’ (or perhaps one should say, sub-zero). So what is it about Franklin that appeals to such a wide array of authors? Was it his strange and tragic loss, along with two great ships and 128 men? Was it the abundant confidence and hubris his officers expressed as they sailed to their doom? Or was it the surreal setting of the endless fields of ice and snow, hundreds of miles from the nearest outposts of so-called civilization, that struck a chord in the imagination. All of the above, I would say. The first Franklin “fiction” – if the term applies here – was a fantastical narrative which appeared in 1851 under the capacious title, The extraordinary and all-absorbing journal of Wm. N. Seldon one of a party of three men who belonged to the exploring expedition of Sir John Franklin, and who left the ship Terror, frozen up in ice, in the Arctic ocean, on the 10th day of June, 1850 ... together with an account of the discovery of new and beautiful country, inhabited by a strange race of people ... As had Edgar Allan Poe with his Arthur Gordon Pym, Seldon deliberately evoked all the language and apparatus of an actual sea-story, while retaining a wry and winking eye to the gullibility of his audience; the book was prefaced with a “Life of Sir John Franklin,” and sprinkled with lurid illustrations of men wrestling with ice, polar bears, and each other. Ultimately, alas, it was a fairly conventional piece of frozen melodrama, written to cash in quickly on the current fascination with Franklin’s fate – and of this species, it would not be the last. Our next candidate is a work by that master of the fantastic, Jules Verne. Those familiar with his other “extraordinary voyages” – Journey to the Center of the Earth and 20,000 Leagues Under the Sea – may be forgiven if they’ve never heard of this work, which appeared under various titles including The Field of Ice, The English at the Pole, and The Voyages of Captain Hatteras. The book had been out of print until a new translation by William Butcher was published by Oxford University Press in 2005. And yet despite its lengthy hiatus, the book reads as well as Verne’s better-known classics, and includes many of the same elements – a half-crazed captain, a mad quest to some unobtainable goal, and a mixture of known and imaginary technological wonders – as do they. The “Captain Hatteras” of the title does not himself encounter Franklin or his men, but he retraces their steps with reverence, making the same pilgrimages to King William Island and Beechey Island that, a few decades later, Roald Amundsen would make in fact. Verne’s conclusion, however, owes little to Franklin or to any other history, save for the old chimera of the “Open Polar Sea.” Verne’s sea is open because it has at its center an active volcano – one can imagine the rest. From Verne’s novel – which first appeared in English in 1865 – to the next is a gap of nearly a hundred years. And yet it is not entirely without surprise that a descendent of James Fenimore Cooper – he whose books Mark Twain derided as the “broken twig series” – who brought this subject to the fore. With Island of the Lost (1961), Paul Fenimore Cooper laid out the basic elements which would feature in many subsequent fictions: the desolate island, the last march of the starving men, and color commentary on the faded glory and misplaced confidence of the men who sailed so bravely into an icy wilderness. The book has been out of print for some years, although a used copy may be found with an ease that suggests it sold reasonably well. Four years later, the Australian novelist Nancy Cato entered the field with her book North-West by South. The particular importance of Franklin to Australians is hardly coincidental; as a crewmember on Matthew Filnders’ first circumnavigation of the continent, as well as one of the early governors of Tasmania, Franklin looms nearly as large in the history of Australia as he does in that of Britain or Canada. A prominent member of the “Jindyworobak” movement which sought to promote Australia’s indigenous cultures and histories, Cato deliberately chose subjects for her fictions which evoked the southern continent’s complex histories. Her portrait of Franklin is neither heroic nor anti-heroic, but rather iconic; he ends up representing all the crooked histories of his several pasts, even as his crew inters him in an immense tomb of translucent ice in the midst of the Victoria Straits. Cato’s was the last word on Franklin in fiction for nearly a decade, until Caroline Tapley’s 1974 young adult novel John Came Down the Backstay. Just as would John Wilson’s YA novel Across Frozen Seas twenty years later, Tapley focused on one of the cabin “boys” aboard the Erebus and Terror, and the natural fears such a lad would have on embarking on such a perilous voyage. The perspective of a young person makes for compelling storytelling, and yet is not quite consistent with the facts, since all four of the “boys” entered into the muster rolls for Franklin’s ships were at least twenty-one years of age upon sailing. Perhaps the most daring, resonant, and influential of all Franklin fictions, Sten Nadolny’s Die Entdeckung der Langsamkeit, appeared in German in 1983. Under the title “The Discovery of Slowness,” a brilliant English translation by Ralph Freedman appeared in 1987, and for the first time British and American readers could experience a book which, among other things, launched a televsion series, an opera, and a business philosophy whose seminars dominated the executive suites of German corporations throughout the 1980’s. The key concept here was “langsamkeit” – slowness – a word whose previous associations had been with mental retardation. Nadolny imagines Franklin as a “slow” child, but sees this not as an impairment but a brilliant gift. The same boy who stood by the schoolhouse wall, unable to catch a thrown ball because he always reached for it after he arrived, found his perfect career in the ice, in a region of the world where being “slow” was just what was called for. Nadolny's novel is notable for the way it combines the carefully-researched actual life of Franklin with the strange conceit of Franklin's "slowness" in such a way that, fanciful though it is, one at times feels as though one is reading his true life story -- or even a truer one. A lively sense of humor and historical irony were melded in the next Franklin-flavored yarn, Canadian author Mordecai Richler’s sprawling and inventive Solomon Gursky Was Here(1990). In Richler’s playful animadversion on all that has come before, one of the frozen bodies of Franklin’s men excavated by archaeologists turns out to have been given an Orthodox Jewish burial. In the ensuing ruckus, the arrival by sledge of a mysterious man named “Toolooah” (a westernized spelling of the name given Franklin by the Inuit) in the outlands of northern Ontario passes almost without notice – until someone realizes who he might actually be. Although both characters eventually are absorbed within the crazy quilt of the Gursky family, the Franklin connection brings a distinctively Canadian twist to the tale; Richler admitted having been inspired in part by the exhumations of the graves on Beechey Island by Owen Beattie. 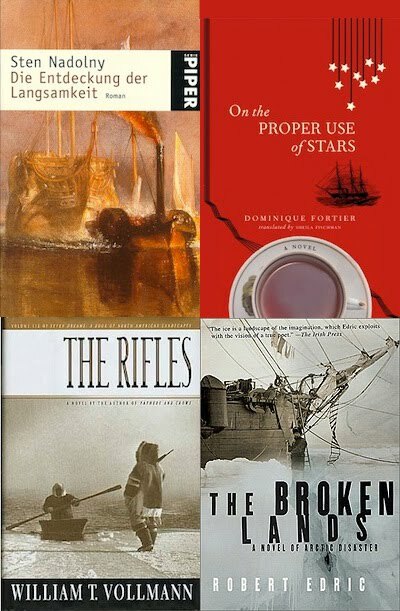 The year 1994 saw two ambitious new Franklin fictions: Rudy Wiebe’s A Discovery of Strangers, a provocative historical novel based on Franklin’s first land expedition of 1819-21, and William T. Vollmann’s postmodern pastiche, The Rifles. Wiebe’s book takes a new tactic in having almost the entire tale told from the view of the indigenous peoples and animals of northern Canada; his portrayals of Keshkerrah and Greenstockings are particularly poignant. Wiebe did extensive research on the Tetsot’ine people of the Dene confederation, a group with which his own ancestors, early Mennonite settlers in the area, had enjoyed friendly relations. He was criticized in some quarters for romanticizing his First Nation narrators, and demeaning Franklin, who is known by his Dene nickname “Thick English” throughout the novel. And the same time, the less-famous members of Franklin’s party, particularly midshipman Hood and ordinary seaman Robert Hepburn are sympathetically recalled, and Hepburn takes a turn as the novel’s central narrator. Vollmann’s The Rifles, published as the sixth of his “Seven Dreams” novels which cover different historical aspects of the colonization of the Americas, is perhaps the most unromantic of all Franklin fictions. The book’s main narrator, like all of Vollmann’s antiheroes loosely based on himself, is a northern vagabond with an Inuk girlfriend, Reepah. The novel hints that they are the reincarnations of Sir John and Lady Jane Franklin, though if true, this must mean that there must have been a considerable karmic debt to be paid off, as these new lives are fraught with poverty, bad teeth, and a profound aimlessness of purpose. Woven in are small sections which halfheartedly re-create the events of the Franklin expedition, as well as a somewhat narcissistic postscript describing Vollmann’s self-arranged sojourn at an abandoned military base on Ellesmere Island. The overall effect is, for me, far from satisfactory, though sprinkled throughout are the usual Vollmann moments of scattershot genius. The last few years of the twentieth century witnessed several new fictions with elements of the Franklin disaster at or near their center, among them Andrea Barrett’s The Voyage of the Narwhal, Brian Hopkins’s Cold at Heart, and John Wilson’s North With Franklin: The Journals of James Fitzjames. For my purposes, Wilson’s is the most intriguing of these, since it attempts something hitherto untried – the extension of an existing historical document. Fitzjames’s last letters home to his sister, posted from Greenland in 1845, were published in part in the 1850’s, and Wilson tracked down the originals. Together, the form a sort of diary, and Wilson imagines in rich and evocative detail how that diary might have been continued, in letters Fitzjames never lived to post. A beautifully written and produced book, it is still well-known in Canada, though less so here in the US; it’s a volume worth tracking down. The next great moment in Franklin-related fiction is drawn from the lives of those who searched for him in vain. In his 2006 novel Afterlands, Steven Heighton, with what Kenn Harper has called “powerful descriptive talent,” re-imagines the experience of the crew of C.F. Hall’s ship the “Polaris” after Hall’s death and the stranding of much of her crew on a southward-drifting icefloe. Drawing from the recollections of George Tyson, the party’s nominal leader, and adding in elements from the lives of Hall’s Inuit companions Tookoolito, Ebierbing, and their daughter Panik, Hieghton manages to be both lyrical and clear-headed in his paean to human folly and human endurance, and does so in a historical novel whose factual backgrounds he meticulously researched. From Heighton’s heights, we descend quickly into the world of Dan Simmons, known for writing historical potboilers in which everything – not excluding kitchen sinks, officers gone mad, and cannibalistic Wendigos scratching at the door – is tossed in for maximum dramatic effect. His Terror (2007) may be both the biggest and the best-selling of Franklin-inspired fiction, and has clearly brought a great deal of pleasure to his devoted fans, despite historical inaccuracies and the heaping of the impossible on top of the improbable. The Wendigo – a legendary spirit of the Canadian north whose bite confers an appetite for human flesh – is of course perfectly fitted to the Franklin expedition, evoking the Inuit testimony given to John Rae and the cut-marks found on the bones of his men, so although it’s highly fantastical, it’s not entirely without historical antecedent. Last year, with Wanting, Richard Flanagan returned to a chapter in Franklin’s life largely ignored in fiction – his time as the Governor of Van Diemen’s Land, now Tasmania. Flanagan, a Tasmanian writer with a long resumé, is particularly interested in Mathinna, an aboriginal girl adopted by Sir John and Lady Jane. For a time, this young girl was lavished with attention, given a room in Government House and sent to a private school. On the Franklins’ departure, however, she was essentially abandoned, and returned to the poverty and outcast status which were the natives’ allotment in those times. Flanagan interweaves the Tasmanian story with that of Charles Dickens, always a fervent follower of Franklin and Arctic exploration. In one of those historical coincidences which, on examination, seems anything but accidental, Dickens has at the same time just lost his daughter and become estranged from his wife. In an endeavor to dramatize the Franklin tragedy, and raise funds for the newly-widowed wife of his old friend Douglas Jerrold, Dickens and Wilkie Collins wrote and staged The Frozen Deep, a play about lost love and lost explorers which was the toast of London. In assembling a cast for a Manchester performance, Dickens cast Ellen Ternan, a young professional actress who would soon become his – possibly platonic, possibly not – companion for the rest of his life. Like Wiebe and Heighton, Flanagan’s story is marked by lyrical nuances and judicious interweaving of historical research, both of which are also hallmarks of the newest Franklin fiction, Dominque Fortier's novel, On the Proper Use of Stars. Fortier juxtaposes a wide variety of sources -- ship-board plays, historical documents, recipes, and even an excerpt from Eleanor Porden's poetry -- with a series of finely wrought epiphanies in which, like ghosts in an icy mirror, we see flashes of Crozier, Fitzjames, Lady Franklin, and Sophia Cracroft. It's an impressive tour de force, and in many ways the most all-encompassing of Franklin fictions -- but it will surely not be the last. Thanks, Russell! I've read many of these books, including The Discovery of Slowness (very strange,in my opinion)and North with Franklin (very enjoyable) but I see I am going to have to buy On the Proper Use of Stars! Again, thanks for the review and refresher of the fiction we can buy and read concerning the Franklin Expedition. Now all I have to do is send the link to this post to my wife as my Christmas wish list. You've made it easy for me! I see that these are full-length novels, but I can think of two short stories on Franklin. Helen Humphreys's "Franklin's Library" (available here: http://www.walrusmagazine.com/articles/2005.07-fiction-helen-humphreys/) and Margaret Atwood's "Age of Lead." Thanks for the tip on the Helen Humphreys story -- that one was certainly new to me! Simmons' The Terror's northern monster is actually a tunbaaq, I believe. His bite doesn't transfer a appetite for human flesh, at least not in that novel. He sucked the souls out of his victims, then either ate them or arranged parts of their bodies to disturb the survivors. Also, I believe Franklin was not the first to die, he dies in the bear blind that they set up to kill the monster, who was already troubling them. I personally love Simmons' book. It was the first I had ever heard of the Franklin mystery, so maybe I am partial to it, but still, I think it's a great read! Thanks for the note on Simmons' book -- not sure I'm familiar wih a "tunbaaq" but perhaps it's a variation on "tornaq," an Inuit shaman's "helping spirit." Whatever the name, the idea of a deadly supernatural spirit of some kind has been a recurring feature of Franklin fiction. I really enjoyed 'The Terror'. I would love to see it made into a quality film someday. I'm still amazed at the job Dan Simmons did in bringing these men to life in the pages of his book though I can't say for sure how accurate his depictions were. I/m curious about the amount research he did and where he did it. Simmons lists his sources (in the hardcover edition, at least) -- he started out with "Ice Blink," "Frozen in Time," and Berton's "Arctic Grail" -- and from there read fairly widely in primary sources and on the internet. It's too bad that Cookman, and not Cyriax, seems to have been his primarly guide on the particulars of the expedition. Somehow, he doesn't seem to have used my site at all, though he cites Wayne Davidson's sirjohnfranklin.com (a fascinating but sometimes erratic source). Yet when all is considered, good historical fiction is much more than the 'sum of its parts' -- sometimes, just the bare outlines are what stimulate the writer's best work. Well, I've just ordered a copy of "On the Proper Use of Stars" from Amazon.ca and look forward to reading and enjoying it! Is the Island of the Lost worth seeking out and reading? There's a copy in my library but I'm a little pressed on time these days. Thanks for this list; I found the Arctic Book Review invaluable when I first started reading up on the expedition but I particularly appreciate this compilation of fiction. Jenny, thanks for your kind words! Martin Selber "... und das Eis bleibt stumm" (I don't know if an english translation exists, but the title means something like "... and the ice remains silent"). The book was released 1955 in East (!) Berlin and was clearly intended for young readers. Because of the place and time it was written there is a lot of (more or less subtle) criticism of capitalism, colonialism and the british society included. But again, it's mainly a story of adventure for adolescents. Franklin is depicted as ignorant Admiral (! ), who leads the expedition into disaster and kills himself when he realizes that everything is lost. Crozier leads the men south and is the last one dying after losing one man after another on the horrible march. The author claims to have included all of the then up-to-date historical evidence and worked his fiction around it. Nice to read if you are a fourteen-year-old interested in great adventures :) It fundamentally shaped my imagination about the expedition from those teenage days onwards. Best regards from Germany & Merry Christmas!